In the summer of 2008, Quinnipiac starting pitcher Derek Lamacchia went on a trip to Long Island that would change his life. As part of a recruiting showcase for the Blue Chip Prospects, Lamacchia was one of the hundreds of young players that got a chance to try and impress Division I coaches from around the country. The organization, one that helps high school baseball players find colleges to play for, took its players down to Bethpage Ballpark, home of the Long Island Ducks. Quinnipiac baseball head coach Dan Gooley remembers everything about that day, because it would change his program for the next five years. The stadium had temporary bullpens set up behind the left field wall for pitchers to throw on. Gooley and three other coaches took a trip down to that area to see who was throwing. As they reached their destination, Gooley looked toward the mound, and there was Lamacchia, a 17-year-old high school junior. Lamacchia’s story is rather impressive. Heading into that trip, he had limited experience as a pitcher. He didn’t believe he had a future in Division I baseball before he became a pitcher. Fortunately for the 6-foot-3, 160-pound righty, Gooley liked what he saw. “I knew there was something special there with Derek, it was evident,” Gooley said. “I thank God every day for the opportunity I have been given at Quinnipiac,” Lamacchia said. Since he began his freshman season in 2009, the Whitestone, N.Y., native has been an asset of the Quinnipiac pitching staff. Lamacchia currently has a 3.83 career ERA and 143 strikeouts in 178.3 innings pitched. Lamacchia caught the attention of Major League Baseball scouts last season, but was not drafted as a junior. 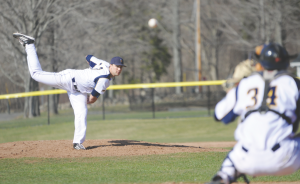 Coming into his senior year at Quinnipiac, Gooley knew that his ace needed to continue to improve in order to become the “complete guy” talent evaluators were looking for. Lamacchia pitched in the North Woods Summer Baseball League this past summer, and put an emphasis on becoming confident in his changeup. “He was a bit inconsistent with it before his senior year, and that was because he was anxious,” Gooley said. Gooley knew that Lamacchia had become confident in that pitch after the October 13, 2012, game against Southern Connecticut. As part of the annual New Haven City Series, the senior pitcher went six innings, giving up six hits and two runs while striking out five. “He had everything working that day. He was basically unhittable,” Gooley said. For Lamacchia, it was just a product of the way he attacks every single day. So far this season his hard work and effort can be seen in his numbers, as well. He has three wins with a 2.30 ERA and 40 strikeouts in 58.2 innings pitched, his best statistical season as a Bobcat. He leads the team in all four of those categories. “You can go to bed on Thursday night knowing that you’re going to get a pretty good effort and a pretty good performance out of Derek Lamacchia, and it helps you sleep a lot easier,” Gooley said. Whenever Lamacchia takes the hill for, often times, scouts with radar guns are behind home plate evaluating his performance. He is not sure yet whether he will be selected in the upcoming MLB draft in early June. One person, for certain, believes he should be. For now, Lamacchia continues to take things as they come. He rarely worries about what will happen after this season.